Due east of Innsbruck and south of Salzburg are Zell am See and Kaprun a dynamic duo of winter and summer fun. We knew we were approaching our destination as the beauty of Lake Zell came into view and the soaring mountains of Kitzstenhorn (3203 meters), Maiskogel (1675 meters) and Schmittenhohe (2000 meters) rose around us. We would spend the first night in Zell am See and move on to nearby Kaprun in the morning to appreciate the combination of their unique features. It was a ten-minute stroll through the lively pedestrian area to the attractively painted apple green Gruener Baum Hotel, Seegasse 1. Our basic room had nice furnishings, except for a too-soft foam mattress. The bathroom was outfitted with a single container of liquid soap, which was attached near the sink. Luckily we had some soap of our own for the shower. Located between the lake and the Schmittenhohe, Zell am See is picture perfect. We already had a nice flavor of the sweet shops and cafes we had passed on the shopping streets so now we found our way over to Gasthof Steinerwirt, Dreifaltigkeitgasse 2, for lunch. There are many rooms from very casual to more formal and all exude traditional alpine comfort. There is an outdoor garden patio that was quite full but we opted to sit inside to avoid the insects, a bit unusual this time of year but so was the sunny, warm weather. We started with goulash soup, followed by a Greek salad for Linda, while the gorilla could not pass on the deer stew. The popularity of this place is understandable considering the reasonable prices and very good food. The best thing about the winding streets is that eventually they all lead to the glorious lake. There are walking and bike paths around the entire 11-kilometer circumference. We joined others taking advantage of the sparkling day and when we reached the area of campgrounds at the north end of lake, we were able to see the peaks of the glaciers of Kaprun, where there is year round skiing. What a place - choose your time of year and there is always a sport or outdoor activity awaiting you. 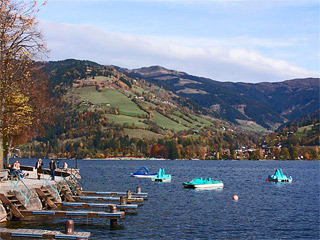 While throngs come to swim, row a boat and enjoy a steady parade of festivities in the summer, fun on the snowy slopes is really king and when the lake freezes the skating enthusiasts are ready. We were too late for swimming and not quite ready to ski the glaciers but we got our taste of the outdoor life walking along the lakeshore, exchanging greetings with passersby. The "Europa Sportregion Zell am See-Kaprun" is dedicated to accommodating and facilitating visitors needs and requirements. There's even a free ski bus shuttle service between the two towns to make it easy to take advantage of the 130 kilometers of pistes of The Kitzsteinhorn, Maiskogel and Schmittenhohe, plus lots of other goodies. After a nice breakfast we visited "Augut" the farm of Familie Pichler, where they raise, slaughter and process pork and beef. Their smoked pork and sausages are very popular with the locals and after tasting a sample we could see why. The beef is packaged in 10 kilo portions and is sold at markets throughout the region. Man cannot live on meat alone so they also do schnapps, cheese and preserves. Their products are all natural with no preservatives. Those so inclined will be interested to know that on the way to Kaprun we passed a 36-hole golf course. We loved our stay at Hotel Steigenberger Kaprun, located in the heart of this adorable ski town. The smiling young women at reception and the bright, contemporary lobby were a cheerful greeting. We were happy campers. Our large bedroom with excellent furnishings, comfy mattress and bedding. Lots of amenities were provided in the large bathroom and separate WC, including terry bathrobes. Best of all was a private balcony with a killer view of the glaciers. Wish we had more time to make use of the extensive wellness facilities. Kaprun appears to be very prosperous with tree-lined streets and very fine boutiques and shops. 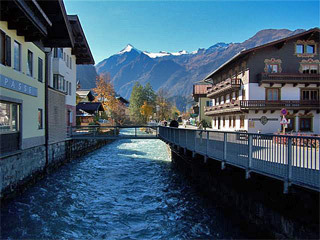 The Kaprun River races through town adding another enchanting element to be enjoyed. High on a hill named Margarethenstein is the Kaprun Parish Church built in the 12th century and dedicated to Saint Margareth. Though small and simple in design, its position on the hill in front of the tall mountains imparts a distinct aura. Just behind the church are the two oldest houses in Kaprun which have been restored and renovated. Both can be visited but unfortunately not this day. We stopped at the oldest guest house in town, Hotel Gasthof Mitteregger, Schlossstrasse 13, for lunch. The extensive menu offered both traditional and contemporary dishes. We both had superb fresh mushroom soup with a soft creamy texture accentuated with a dab of schlag Followed by thick filets of perch with flat noodles and creamed spinach. Everything was freshly prepared by a caring kitchen. Reasonable prices and excellent service in comfortable surroundings make this an awfully good value. In the basement of the Sportkristal Hotel is the Car Museum, which was undergoing some renovation, but still available for a visit. Theres an incredible assortment of vehicles from tractors to motorcycles, buses, trucks and cars all packed into a very small space. Hopefully the construction will create more space to better display the collection. 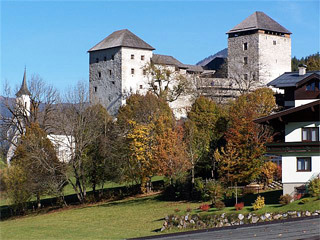 Kaprun Castle is thought to have been constructed around the 12th century because of the Roman architecture on its east tower. It was acquired by the "Burgverein" association in 1984 which has done extensive restoration, which seems to be ongoing. It is a wonderful venue for festivals, arts and cultural events. There is a stage and seating in the courtyard for productions and the Knights Hall and adjoining rooms are quite splendid for staging events. Jausenstation Unteraigen, Schaufelbergstr. 66, is a guest house above town, right at the start of the Maiskogel skiing piste. It is here that some of the finest Schnapps in the country is brewed in a small stone room called the Schnapsbrennereil. Dad was away but his son, who works with him, was happy to show us how the process works. Not so long ago they installed modern machines which are still fired by wood. The crushed fruit is boiled and the steam becomes liquid (alcohol) in three stages. The first stage produces a poison, strong enough to kill. The second stage is when the highest quality schnapps is produced, which must be diluted to be suitable for consumption. Light alcohol, a rubbing compound for what ails you, is produced in the third phase. The secret to success is using the best fresh fruits, maintaining the right temperatures and timing throughout the process and diluting with the purist drinking water which happens to be readily available here. Survival depends upon the brewers ability to test without drinking too much of the stage one poison. Dinner in the hotel restaurant was less than memorable. The smoked brook trout with rucola pesto and mustard and parmesan sauce was good as was the apple/pear juice. But the John Dory on piquant paprika sauce was over-salted, the saffron rice was boring and the vegetable mixture was of the budget variety. The only good thing about the ice cream was that is was cold. There was a nice salad bar which the waiter failed to tell us was included with our dinner nor was it indicated on the menu. The service was slow and clumsy. Considering the excellence of the breakfast buffet, buffets for all meals might be the way to go.